Tales of Berseria is announced! 6 juni, 2015 Säg något! 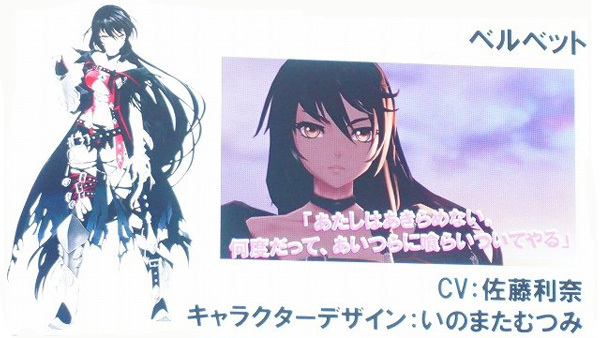 So Bandai Namco has announced the newest Tales of game, its Tales of Berseria! It will be released for PS3 and PS4. Hopefully we’ll also be getting this title in the west. The game will feature character design by Mustsumi Inomata (Tales of Graces ƒ, Tales of Hearts R and more). The game will feature a female protagonist, who seems to be a pirate named Velvet. Right now more info is pretty scarce, but we know Ufotable is doing the animations again. So they will at least be of high quality and here is a bad picture of Velvet, but hopefully we’ll be getting better artwork pictures later.